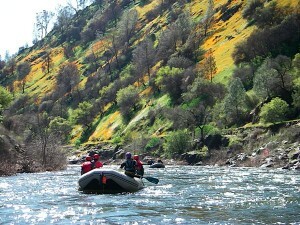 Options for lodging near the Merced River range from rustic and rugged to cozy and comfortable. Charming hotels and B&B’s are plentiful in the California foothills. The Yosemite Bug Mountain Resort and Hostel is a nice option for boaters who want a solid roof over their head but don’t want to spend a lot of money on a hotel. With so much wilderness surrounding the Merced River, camping is easy to find and designated campsites typically have bathrooms and running water. The Yosemite Bug Hostel (and spa, restaurant, hangout extraordinaire) is the place to be in the summertime whether you’re a boater or just a traveler on your way to Yosemite. River guides and kayakers have been known to get “eddied out” here for a while. Originally an 1850’s overnight stagecoach stop, this charming home is conveniently located in old country and 25 minutes from the AO meet place. On the grounds are two guest cottages, main house, old lumber mill, and ranch. Guests arise each morning greeted by a fresh and homemade family-style breakfast in the dining room. Each guest room is elegantly decorated with antiques and has a private bath. After a long day exploring the nearby sites guests can dip their toes in the seasonal creek, take a walk in the meadow, or view the scenery and wildlife from the front porch. This charming restored country home is the perfect getaway for anyone looking to relax and enjoy the feeling of home away from home. Three full bedrooms are available to the guests, each filled with beautiful European and American antiques. Each bedroom is furnished with a queen oak-carved bed, private bath, and bathrobes. Guests can also enjoy the gardens surrounding the home, patio hot tub, and complimentary beverages and hors d’oeurves. Each morning convenient to your schedule, a full gourmet breakfast is served and outside dining is available. This location is about 8 minutes from the AO meet place. Only about 20 minutes from the AO meet place, this location allows you to enjoy camping along the beautiful Merced River in three campgrounds. Sites are first-come first-serve and each offers fire grills, picnic tables, pit toilets, garbage collection, and access to the Merced River. Campgrounds are accessible only by crossing the narrow bridge at Briceburg and heading down river on the road (old Yosemite Valley Railroad grade). Trailers and RV’s over 18 feet are not recommended to cross the bridge.